Like most people the last place I want to spend my holidays is in the kitchen. Now I do go to my family's house so even though I don't cook I am not evil. I would sit there and watch my mum wash 40+ dishes. So I am normally slaving over the sink with her. But instead of spending an hour over the sink we plan to only spend 10 minutes there. How you may ask? Repurpose dinnerware!! You see we never went this route before, because even though we aren't "Green" we do try to do our part in not making more mess then necessary. When we found a company that made dinnerware from a plant source instead of plastic we knew we just had to check them out. 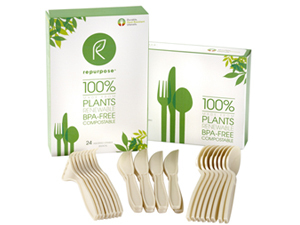 Better yet their products are free of chlorine, 100% compostable and they use soy-based inks. Meaning that our carbon footprint has just be dramatically reduced!! We only get this one world, we need to do our part to keep it clean. If that can be done, by doing something as simple as switching to compostable dinnerware I don't understand why everyone is jumping on board?!!!! And if you are thinking well maybe they dont offer everything we need? They do! 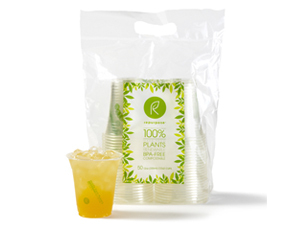 They offer plates in 2 sizes, bowls, cups, hot/cold cups with lids and utensils. The only thing they are missing is napkins! 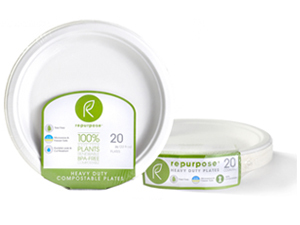 You get peace of mind knowing All of the products available at Repurpose are durable, renewable, non-toxic, BPA-free, and 100% made from plants, not petroleum. They are also compostable within 90 days in an industrial composting facility.